Brianna Cummings dribbles the ball in GW's win against UMass. Cummings returned from injury Friday in GW's win over George Mason, stepping back into a role that had increased this season. Without the team’s leading scorer, the Colonials have dropped three of their last five games and conceded 66.6 points per game during that stretch compared to their season average of 63.1, which was as low as 61.2 just last month. The Colonials outlasted Dayton last Sunday, but then fell to St. Bonaventure in an overtime nail-biter before taking another hard hit against VCU in a double-digit loss Saturday. While the week’s decisions may have been disappointing for the now 21‒6 (11‒3 A-10) Colonials, they highlighted how GW reworked some of its defensive strategies to remain a threat in Atlantic 10 play. And a silver lining does exist: GW’s guards stepped up to minimize production from its opponent’s top scorers. Over the three-game span, the guards contributed 68 rebounds to the Colonials’ 128 total boards. The posts, junior forward Caira Washington and sophomore Kelli Prange, were focused on boxing out Dayton’s 6-foot-5-inch forward Saicha Grant-Allen down low, so the guards needed to cover the rest of the floor. Tsipis said guard rebounding was vital, as sophomore Brianna Cummings matched Washington’s seven rebounds to pace the Colonials against the Flyers. Graduate student Lauren Chase finished with five boards and junior Hannah Schaible added four. Tsipis said he talked to Schaible and Cummings at the halftime about being more active on the glass. Both guards reacted and combined for a total of eight rebounds in the second half. Along with rebounding, the guards also did a good job of stopping the Flyers’ inside scoring. With tight perimeter coverage and defensive balance, the Colonials forced Dayton to settle for tough shots from beyond the arc. Dayton was 5-for-14 from beyond the arc and only made 16.7 percent of attempted treys in the first quarter. The guards also managed to limit sophomore guard Jenna Burdette, who prior to the GW game was averaging 10.9 points per game. GW held Dayton’s top scorer to four points and forced her into four turnovers. Dayton struggled to control the ball and turned the ball more than 20 times, allowing GW to exploit their mistakes and score 23 points off the Flyers’ lost possessions. By delivering on-target passes and opening up lanes in the low post, the guards took control both defensively and offensively against Dayton. Even during the loss to St. Bonaventure, the Colonials stayed equally as aggressive and won the battle of the boards for the 25th time in 26 games this season. Notably, Schaible garnered eight rebounds, Chase added seven and Cranshaw notched five. 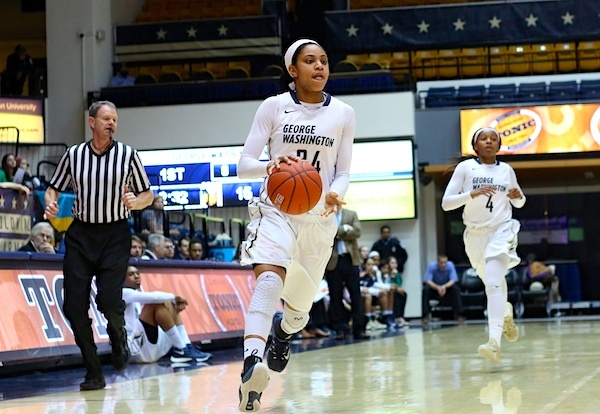 Against VCU Saturday, however, GW proved not all questions are answered defensively. The Colonials allowed their third-highest point total (79) all season to the Rams, and were bested on the glass 46–41. Chase and Schaible led GW’s guards with six rebounds each. Despite moving to 11‒3 in conference play, GW clinched a first-round bye in the tournament after Fordham’s loss to Richmond on Wednesday. Even with some breathing room as they head into the final regular-season contests, the Colonials will need to continue to make strides in upcoming matches. The Colonials look to snap the two-game skid on Wednesday when they host Richmond. Tip-off at the Smith Center is set for 7 p.m.